In 1985, Steven Avery was convicted of sexual assault and attempted murder and served 18 years in prison before being exonerated by DNA evidence. After his release, he filed a multimillion dollar civil lawsuit against Manitowoc County, Wisconsin. In November 2005, while this suit was pending, he was charged and later convicted of the murder of Teresa Halbach and sentenced to life imprisonment without possibility of parole. The handling of the Halbach murder case was highly controversial and his defense lawyers, Jerome Buting and Dean Strang, argued that their client had been set up by his judicial rivals. Avery’s 2007 murder trial and its related issues were the focus of the wildly popular and provocative Netflix original documentary series, Making a Murderer, which was released in December 2015. 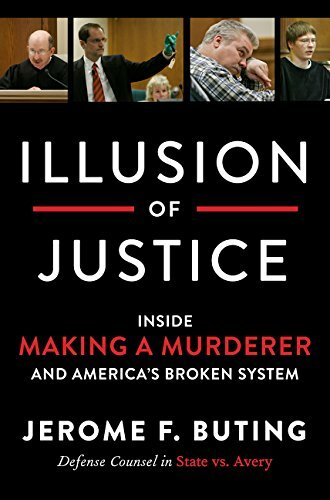 In Illusions of Justice: Inside making a Murderer and America’s Broken System, Jerome F. Buting links his version of the Avery murder trial with other cases from his 35-year career as a criminal defense attorney. From his early career as a public defender to his success overturning wrongful convictions working with the Innocence Project, Buting’s first foray into memoir delivers an insightful look at the rampant bias and shocking realities of criminal defense law. Buting states that his purpose in writing this book was not to “retry the Avery case day by day” but to highlight what he saw as the central issues in the case. He states that his perspectives were shaped not only by the facts of the case but also by his previous experiences as a criminal defense attorney. In this easy to read narrative, Buting explores his personal life, which includes a deeply personal and emotional account of his battle with cancer, while explaining and outlining his career-defining cases. He also sheds light on the imperfections of America’s justice system and provides a thought provoking and credible outline for its improvement. He goes on to write, “The saga of Steven Avery, which unfolded in a sweeping narrative studded with intricate detail, stunned many as a portrayal of a badly warped American justice system.” When he agreed to team-up with fellow defense attorney Dean Strang in the Avery case, he instinctively knew that they were involved in a tragic case that bordered on Shakespearean proportions. Buting’s Illusion of Justice is thought provoking and delivers critical interpretations and powerful commentary on the problems that are plaguing our criminal justice system. Through painstaking analysis and evidence, the author provides an unyielding and persuasive argument both for Steven Avery’s innocence and the need for change within our criminal justice system. His unwavering advocacy for justice in the face of overwhelming obstacles is commendable and must be applauded. This book is a must read for legal scholars, true crime enthusiasts, or anyone interested in the complexities of America’s criminal justice system.